" . . . . written on the palm of ma' hand", taking a rare lunch break here at Generator to post some process work. 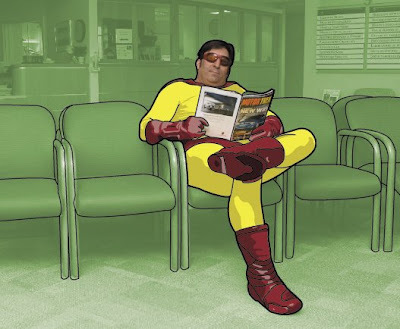 Currently I am working on a short comic book based on the character, "Prostate Man". It's actually a redesign project of a comic strip that was created a year previously. There is a mix of photography, vector art and bold graphics. I was given the reigns to interpret the script how I see fit. It's been a lot of hard work and long hours. I'm really looking forward to seeing it in print. So many hours in front of this screen makes me want to paint . . . traditionally with actual canvas, paints and wooden brushes! Maybe next week, I need to make some headway before this gallery stuff begins to pick up.